Your dog will be fully prepared for your outdoor activities with the Hurtta Downpour Overall Dog Suit in Raven! 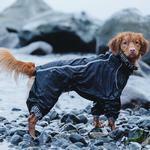 The Hurtta Downpour Overall Dog Suit protects your dog in changing weather conditions. The durable outer material is waterproof and dirt resistant making it ideal for rain, wind, and muddy weather. 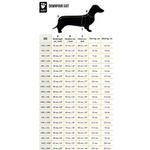 The high visibility 3M reflectors will keep your pup visible and safe even in the dark. Besides a high collar, this raincoat has a waterproof rain trap made of tricot around the edge of the collar, preventing water from getting in the coat along your dog's neck. 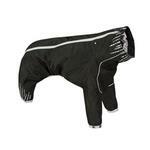 With adjustable leg length and the neck and waist adjusters, you are sure to find a perfect fit for your pup. The Camo version (sold separately) has a bug repellent Clariant treatment that will protect your pup from pesky insects.